Intercropping and Push-Pull | Infonet Biovision Home. Push-pull plot during 2nd season, maize and desmodium with Striga border crop. The plot is bordered with Napier grass. Intercropping is a multiple cropping practice involving growing two or more crops in proximity. The main goal of intercropping is to produce a greater yield on a given piece of land by making use of resources or ecological processes that would otherwise not be utilized by a single crop. Intercropping is growing two or more crops at the same time in the same field. It is a practice often associated with sustainable and organic farming. It is commonly used in tropical parts of the world, particularly by small scale farmers in Africa, but it is far less widespread in the mechanised agriculture of Europe and North America. In intercropping, there is often one main crop and one or more added crops, with the main crop being the one of primary importance because of economic or food production reasons. The two or more crops used in an intercrop may be from different species and/or different plant families. The most common goal of intercropping is to produce a greater yield on a given piece of land by making use of resources that would otherwise not be utilised by a single crop. Careful planning is required, taking into account the soil, climate, crops, and varieties. It is particularly important not to have crops competing with each other for physical space, nutrients, water, or sunlight. Examples of intercropping strategies are planting a deep-rooted crop with a shallow-rooted crop, or planting a tall crop with a shorter crop that requires partial shade. When crops are carefully selected, other agronomic benefits are also achieved. Lodging-prone plants (those that are prone to tip over in wind or heavy rain) may be given structural support by their companion crop. Delicate or light sensitive plants may be given shade or protection, or otherwise wasted space can be utilised. An example is the tropical multi-tier system where coconut occupies the upper tier, banana the middle tier, and pineapple, ginger, leguminous fodder, medicinal or aromatic plants occupy the lowest tier. Intercropping of compatible plants also encourages biodiversity, by providing a habitat for a variety of beneficial insects and soil organisms that would not be present in a single crop environment. This biodiversity can in turn help to limit outbreaks of crop pests by increasing the diversity or abundance of natural enemies, such as spiders or parasitic wasps. Increasing the complexity of the crop environment through intercropping also limits the places where pests can find optimal foraging or reproductive conditions. It involves the component crops arranged in alternate rows. It is also called alley cropping. A variation of row cropping is strip cropping, where multiple rows or a strip of one crop is alternated with multiple rows of another crop. In relay intercropping, two or more crops are grown in the same piece of land during part of the cropping season. A second crop (usually a cover crop) is planted in the same field as the first crop after the first has achieved reproductive maturity but before it has reached physiological maturity. This helps avoid competition between the main crop and the intercrop. It also uses the field for a longer time, since the cover crop usually continues to grow after the main crop is harvested. 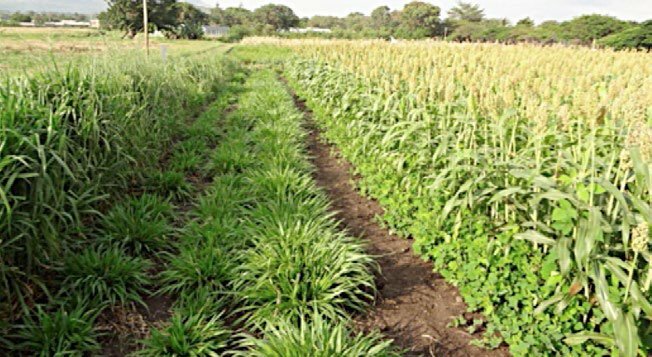 Push-Pull is a simple cropping strategy, whereby farmers use Napier grass or Bracharia grass and desmodium legume (silverleaf or greenleaf desmodium) as intercrops in maize. Desmodium is planted in between the rows of maize. It produces a smell or odour that stemborer moths do not like. The smell 'pushes' away the stemborer moths from the maize crop. On the other hand, Napier grass (Pennisetum purpureum)/ Bracharia grass (Brachiaria cv Mulato ) is planted around the maize crop as a trap plant. Napier grass/Bracharia grass is more attractive to stemborer moths than maize and it 'pulls' the moths to lay their eggs on it. But Napier grass/Bracharia grass does not allow stemborer larvae to develop on it. When the eggs hatch and the small larvae bore into Napier grass/Bracharia grass stems, the plant produces a sticky substance like glue which traps them, and they die. So, very few stemborer larvae survive and the maize is saved because of the 'push-pull' strategy. 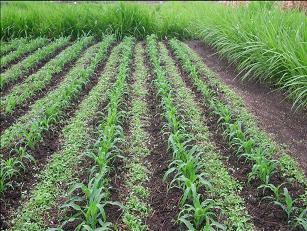 In addition, a ground cover of desmodium (silverleaf or greenleaf), interplanted among the maize, reduces Striga weed. Research has shown that chemicals produced by the roots of desmodium are responsible for suppressing the Striga weed. Therefore, Striga does not grow where desmodium is growing. Being a legume, desmodium also fixes nitrogen in the soil and thus acts to enrich the soil. Desmodium is perennial and must only be planted once. As desmodium seeds may not always be available, desmodium can also be planted using vines. This can be an easy and cheap method to plant desmodium vines. Conventional push-pull uses napier grass and silverleaf desmodium. Climate smart push pull uses two drought-tolerant species: Brachiaria grass (Brachiaria cv mulato II) and greenleaf desmodium (Desmodium intortum). Bracharia grass is native to Africa. Two varieties of Brachiaria known as Mulato and Mulato II, are drought tolerant, recover fast after grazing, show high plant vigour, give good quality forage and are tasty to the animals. Brachiaria does not have stinging hairs, making it easy to cut and carry. 1. Plant Napier grass/Bracharia grass in a border around the maize plot. 2. Plant at least 3 rows of Napier grass/4 rows of Bracharia grassall around the maize field. Apply 2 handfuls of well decomposed farmyard manure in each hole. 3. In the first year, plant Napier grass/Bracharia grass before the rains so that is has a start on the maize. The stemborer moths will like the larger Napier grass/Bracharia grass even more than the maize. 4. Get desmodium seeds from seed companies (Kenya seed, 'Western Seed & Grain Co. Ltd.' in Kitale, Western Kenya) or your neighbour who has started growing it. For 1 acre of land 1 kg of desmodium seed is needed. 5. Alternatively, you may plant desmodium vines. In this case plant the vines when there is enough rainfall and soil is moist. 6. Prepare the soil carefully so that it is as fine and clean as possible. 7. Using a strong pointed stick, make a furrow in the middle of the rows where the maize will be planted. 8. Mix the desmodium seed with fine sand or fine soil (about 1 handful of seed and 2 handfuls of sand). 9. Plant desmodium with the rains for maximum germination. 10. Plant your maize in the field surrounded by Napier/Bracharia grass. 11. 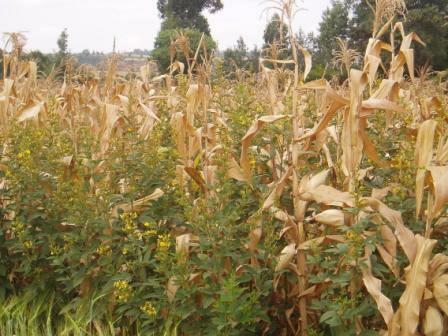 After 3 and 6 weeks, trim the desmodium so that it does not overgrow in between the maize plants. 12. Keep the field weed free so that the Napier/Bracharia has a start on the maize. The moths will like the larger Napier/Bracharia more than the maize. 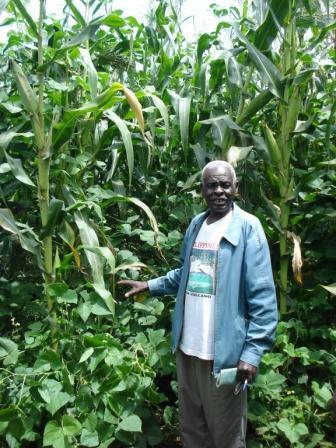 Increase maize yield by 25 - 30% in the areas where stemborers are the only problem. Where both stemborers and Striga are problems, you can double your maize yields. Increase the supply of cattle feed from harvesting Napier grass/Bracharia grass and desmodium. Fix nitrogen into your farm soil by desmodium legume, so you save on fertiliser costs. Protect your soil from erosion, as desmodium acts as a cover crop. Retain soil moisture, as desmodium acts as mulch. Earn money from the sale of desmodium seed at an attractive price of between Kshs 600 and 800 (US$ 8 to 10) per kg. Make more money from increased milk production and sales. Save on farm labour, as you do not have to manually remove Striga weed from the farm. Protect maize from strong winds, by surrounding it with Napier grass/Bracharia grass.